My Compassion in Art series continues with a look at the subject in photography. 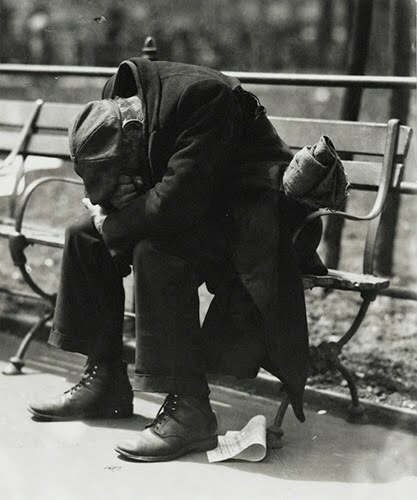 Like Dorothea Lange (1895–1965), Berenice Abbott (1898–1991), and Margaret Bourke-White (1904–1971), Consuelo Kanaga was an important documentary photographer in the middle of the 20th century. Unlike her contemporaries, despite a successful career of sixty years, Kanaga received little public acclaim or critical success in her lifetime. Her political and social ideologies guided her art. At a time when most social commentary in photography involved images meant to shock the viewer into action, Kanaga's images seduced the viewer with careful composition, intuitive cropping, and reframing. Kanaga moved from San Francisco to New York in the 1920s. When first in New York, Kanaga became interested in documenting urban poverty and deprivation. At the same time that she was producing pleasing portraits of middle-class people to support herself, she was also creating sympathetic portraits of the inner-city poor. The Great Depression (1929–1940) provided Kanaga with ample subject matter in terms of people left with nothing and nowhere to go. Her intent in her documentary photographs was to give the public something to think about to prevent poverty, not to shock or shame them. By choosing a close-up on the man on the bench, her point could hardly be considered subtly accomplished. Zoe Strauss is a native of Philadelphia. Previously known for her public art happenings and installations, Strauss took up photography in 2000, when she embarked on a ten-year project called Under I-95. She went all-in, devoting her life to the project, and came out the other side an elected member of the famed Magnum Photos cooperative. An epic, open-ended narrative in photographs “about the beauty and struggle of everyday life,” Under I-95 hinged on an annual, one-day exhibition of Strauss’s street photography—in the form of color photocopies priced at five dollars each—on the concrete pillars under an elevated section of Interstate 95 in South Philadelphia. 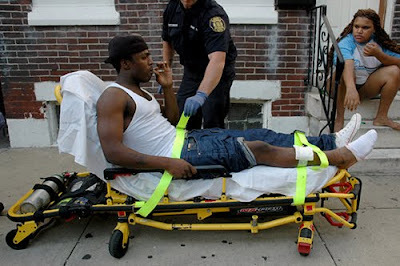 Although she has photographed in other cities and countries, Strauss continues to document the everyday people in neighborhoods of Philadelphia. Strauss’ work is reflective of the sophisticated evolution of the Snapshot Aesthetic style of photography. The style flowered during the 1960s in the hands of such artists as Diane Arbus (1923–1971) and Garry Winogrand (1928–1984). It mimicked the candid, un-posed, spur-of-the-moment pictures taken by amateurs and middle-class families. Interestingly, between the 1960s and the 2000s, the style has been refined to subtly reveal psychological investigation by the photographer. What more disturbing element for Strauss to document than the out-of-control gun violence in the US? When you wake up every night at 2 am and hear gun fire in the neighborhood, then that is not a good thing. Unfortunately, as Strauss points out in this photograph, Americans seem to take gun violence casually, even when they are the victim themselves. Read part one, Compassion in Art (Printmaking). I’ve posted before about how the idea of abstraction has been around since the earliest art produced by humans. However, somehow in the West we think that Western artists “invented” abstraction. The idea of “Mod” as a style evolved during the 1960s with Beatnik and Hippie aesthetics applied to high fashion. It was the first period in fashion design in which contemporary trends in painting were applied to clothing design. Having been a child during the late 1960s, I can vouch for the fact that some of what was designed was incredibly hideous. But, there are some “mod” designs that are truly tasteful and elegant. 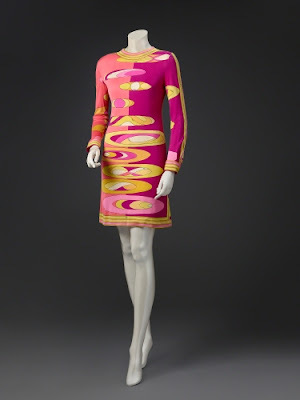 The Pucci dress is an example (which I’m sure very few women could afford). 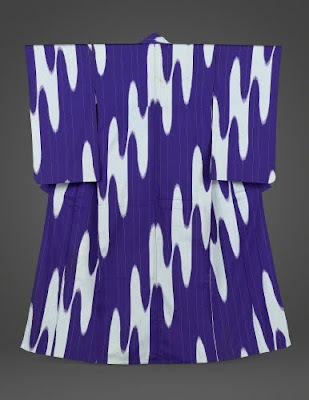 But, oh look, there’s a similar vertical pattern in the early 1900s kimono! Do we call that “mod” too? This elegant dress, which probably cost hundreds in the 1960s (a lot of money back then), is the epitome of 60s mod. Pucci was once dubbed the “prince of prints” because of his designs. He introduced abstract patterns based on contemporary art into fashion in the 1950s. The 1950s were the “Leave it to Beaver” era! Pucci is such an interesting artist. He studied agriculture at the University of Milan in the 1930s, the got an MS in social science from Reed College in Portland Oregon. He also received a doctorate in science from the University of Florence. I’m not sure where design came into the mix, but he was first noticed designing ski fashions for the Reed College ski team in 1947. Pucci’s ski fashions inspired him to introduce his own line in 1948 in Capri. He initially designed ski wear and swimwear. His experimentation with bold and bright colors led him to designing scarves, which ultimately led him to designing women’s fashions. By the 1960s, his designs were popular with such heavy-weights as Marilyn Monroe (1926–1962). Pucci’s abstract designs started to be featured in women’s clothing in the 1950s, at that time a real novelty. He was inspired by Southeast Asian batik, African motifs, Sicilian mosaics, and heraldic motifs. As a colorist, Pucci was inspired by the landscape of the Mediterranean, and also from Southeast Asian countries he visited. 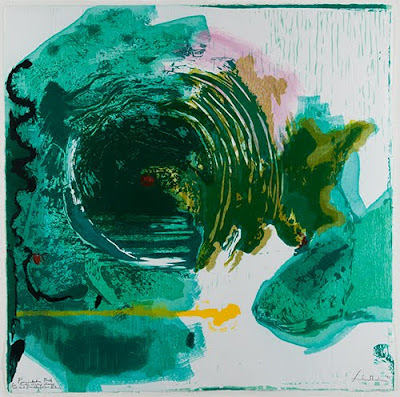 I think we can see that the result of all of his influences is this sophisticated abstraction that reminds one of a Hans Hofmann (1880–1966) painting. His designs also have the sense of landscape. Again, Hofmann! Interestingly, the same thing (landscapes) inspires kimono patterns in Japan. Any doubts? Look at this screen by Ogata Korin. Tell me there isn’t abstraction in this painting! Kimonos evolved during the Heian Period (794-1185 CE) in Japan. It became fashionable at that time to layer up to thirteen(!) silk kimonos of differing patterns and colors as a sign of social status or seasons. After the forced opening of Japan to Western trade by the US in 1853, there was the inevitable introduction of Western fashion, which ultimately doomed the kimono as everyday wear. By the time of World War II (1939–1945) to the present day, kimonos have been worn a lot for special occasions. In many Japanese art forms, pattern is a key element. Japanese art informed the Arts and Crafts Movement, Art Nouveau, and Impressionism in the West. I would like to think that this kimono from the 1920s or 30s would fit right in on a 1930s Art Deco movie set as a nice contrast. You can delve into the history of art as I leave you with this question: Where (precisely) do you see abstraction in art?